Will this season be filled with diamonds, polkis or coloured stones? Let’s find out. It’s that time of the year again when jewellery, fused with fashion, takes centre stage. As the wedding season approaches, some brides are seen breaking their heads over their wedding, and then there are some who have it all together. Preparations for the wedding seem endless, be it food, invites, décor, garments or jewellery. Apart from the lehenga and the food, it’s the jewellery that perhaps commands the most attention at any wedding. An integral part of a bride’s wedding trousseau, jewellery adds the perfect dash of effervescence to any outfit. Finding the right bridal jewellery can turn out to be an arduous task. Every bride wants to feel like a princess on her special day. Adding a touch of elegance are the diamond neckpieces that will be a perfect match for a blushing bride’s graceful attire, adorned with rubies or emeralds. Or polki sets that reflect tradition and authenticity of Indian culture. Be it a quaint or a contemporary bride, brands today offer effortlessly graceful jewellery designs which can be adorned with the age-old traditional or contemporary Indian ensemble. So what are you picking? Bridal jewellery today is traditional yet contemporary. Trends are evolving practically every season. So how should today’s bride decide? “Most brides prefer jewellery that are heirloom pieces but can be worn on several occasions and are not just locked away. 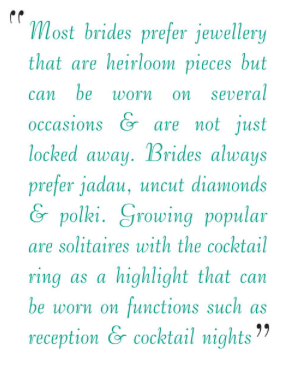 Brides always prefer jadau, uncut diamonds and polki. Growing popular are the solitaires these days with the cocktail ring as a highlight that can be worn on functions such as the reception, cocktail nights, sangeet, etc.,” said Mr. Sunil Datwani, owner of Gehna Jewellers. Ask the team at Jasani, The Jewellery Lounge, and they will explain that though diamonds have always been a girl’s best friend, her social circle today extends to include rubies, emeralds, pearls, topaz, amethyst and other beautifully coloured stones. Colours add sheen to your otherwise plain diamond jewellery, and you can even match the colours to your wedding dress! Fancy shaped diamonds like pears, marquise, emerald cut, princess and ovals, look stunning when mixed with traditional round diamonds, so you can literally combine anything to suit your fancy and create an absolutely unique look! As we have already established, the Indian bride is more creative than just relying on the trusty diamond. “With changing times, the assortment of bridal jewellery today ranges from diamonds and emeralds to tanzanites, pearls and corals. From uncut diamonds to more contemporary jewellery, India has taken a step forward in designing. 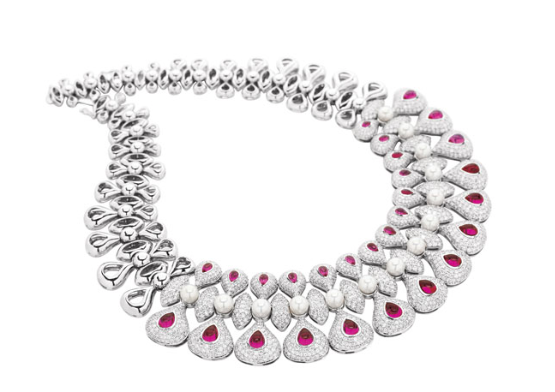 There has been a tremendous evolution in jewellery trends,” said Mr Biren Vaidya, MD of Rose Jewellery. He furthered, while yellow gold is the first choice for bridal jewellery, the modern bride is taking a step ahead and breaking the mould. 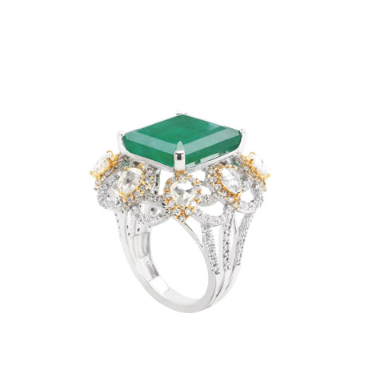 “The modern bride likes a mix of gemstones in her wedding jewellery. Design and craftsmanship too play an important part in choosing one’s wedding trousseau,” he said. The design varies from bride to bride depending on factors like her personal taste, body structure and clothes that she’ll be wearing for the wedding day. 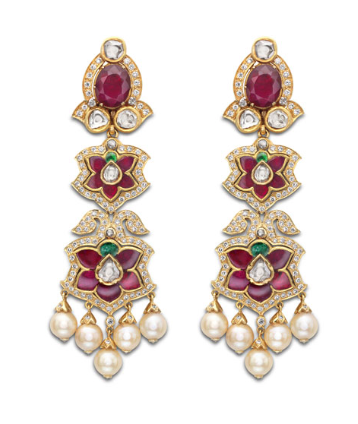 For the bridal theme, gemstones like diamonds, rubies, pearls and emeralds set in white and yellow gold are seen making an appearance almost always. Yellow gold is dominant for the more traditional wedding. And for evening functions like receptions and parties, diamonds with white gold take a bow. “A lot of times, brides experiment with the maang tikkas and the kadhas (bangles). These jewellery pieces can be crafted in interesting ways with a tinge of colour from precious and semi precious stones,” said Mr Datwani. Brides are seen breaking conventions and are not afraid to experiment with unique jewellery. The chandbaalis available at Gehna have won a lot of popularity. Their Mashrabiyas collection, inspired by architecture, is also preferred for a lot of occasions owing to its versatility, including weddings. But how does a bride break the clutter and set a trend for others to take a cue from? Ask the team at Jasani and they will explain that the use of coloured diamonds is a new and upcoming option for today’s brides. Shades of pink, yellow and brown are surely going to make your heart melt while the use of pearls in necklaces and earrings will add the ideal finishing touch to your jewellery according to them. Embellished mangtikkas and turban headgears are a must this season according to them, and the idea behind wedding jewellery is to wear it with style, and not overdo it. So if classic pieces like a single string of diamonds or even fancy coloured pearl string does it for you, then who are we to stop you? Agreeing with this is Mr Vaidya, and he explained, “Colours, I feel, is the new trend and this has been the inspiration for our Colours of Life collection. In terms of designs, pieces that take inspiration from the nature with motifs like flowers, paisleys, leaves and others, are something that is seen often lately. Metallic hues of gold like rose and dull gold is also something that lends a strong bridal appeal.” The bride today, therefore, is not necessarily looking for heavy or multiple jewellery. One classy, unique piece – and she is done and adorned! While weddings continue to get more intricate and detailed, the jewellery must balance and, of course, complement the entire occasion. “Weddings have always been an important part of our traditions giving in to big celebrations. The detail specific weddings, destination weddings, themes etc., do add an element of fun and frolic. In terms of jewellery, the brides become more selective. Most of the times, the jewellery for the traditional pheras remains ethnic, and for other occasions, the brides prefer theme specific jewellery like floral, coloured stones, solitaire, cocktail rings etc.,” said Mr Datwani. Mr Vaidya, on the other hand, points out that the cultural and social element of any country plays a vital role in almost everything! “The wedding industry today has grown into an empire and is relatively huge. Everything, right from the jewellery ,clothes, flowers, music and many other elements that are a part of the ceremony, can be catered by the wedding industry today,” he said. Jewellery has always been an integral part of the Indian culture and will continue to remain the same. There’s no denying that! Even the team at Jasani agrees and has come to terms with the fact that the Indian bride and groom are spreading their wings and want to personalise their wedding. Becoming more detail specific and having a fixed idea in mind, they simply know what they want. This is also true in respect of jewellery and brides today prefer to give a personalised touch to their jewellery. She takes pride in wearing a one of a kind piece owned only by her. Bride and groom are well educated about diamonds and jewellery trends and hence come up with their own ideas to style every piece on their own…It can be as simple as getting your names engraved on the ring or wearing your birthstone or even mix and match designs to suit your style. Have you sketched out your jewellery in your mind?